The Maya Calendar predicted that the world would end in 2012. 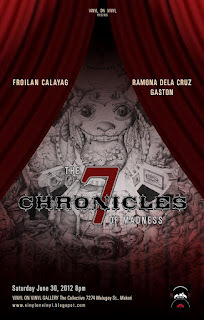 In The 7 Chronicles of Madness, artists Froilan Calayag and Ramona Dela Cruz-Gaston have taken this prophetic circle of doom and turned it into a labyrinthine carnival overflowing with naïf creatures, esoteric symbols, inside jokes, personal memories, snatches of everyday conversations, and meditations on the future. 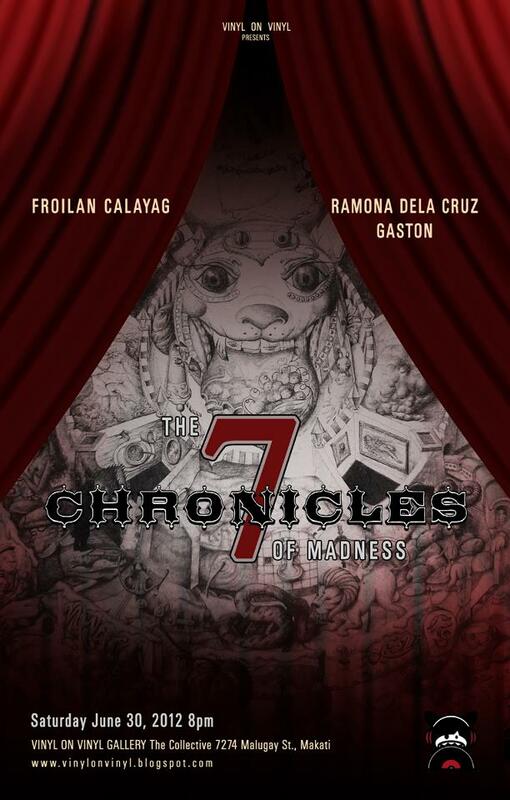 Calayag, a well-established artist with five solo exhibitions, is a dark prince of fairy tales. His three-dimensional paintings, sinister and beguiling at once, are populated by deceivingly charming beasts with predatory eyes and rictus grins. His brush is capricious, guided solely by the whims of his imagination. Dela Cruz-Gaston, on the other hand, is an art-scene ingénue who favors the mandala—technical, geometric, and deliberate—as her medium. Her flat-perspective symmetrical designs require methodical planning that is almost the antithesis of Calayag’s impulsive nature. is impossible to tell where one artist ends and the other begins. Composition-wise, the concentric circles that make up Mad Calendar echo the piece’s Mayan foundation. At its center, a hybrid creature, white-furred and open-mouthed, replaces the Tonatiuh, the Mexican sun god. Around this blue-eyed beast are four layers, teeming with images. In the innermost wheel, the four elements—earth, water, air, and fire—alternate with human basic needs. Beyond, the four cardinal directions punctuate 12 petals, one for every month of the year; and in the outermost wheel, 31 divisions representing the number of days in a month. The 12 signs of the Zodiac are likewise present, scattered throughout the circles. Avatars of Calayag and Dela Cruz-Gaston—a prickly pumpkin and a young girl with lucky clovers in her hair, respectively—watch the colorful abundance unspool before them. In place of the Maya Calendar’s glyphs, the artists have painted brief but luminous visual metaphors, which, taken together, form a radial constellation so full and so generous that the eye is overwhelmed. This visual bounty is separated from a black void by a wall assaulted on all fronts by a noxious green morass of negativity: a knife through a heart, broken crayons and broken dreams, general decay. The wall holds firm. Battered as it is, it is not breached. 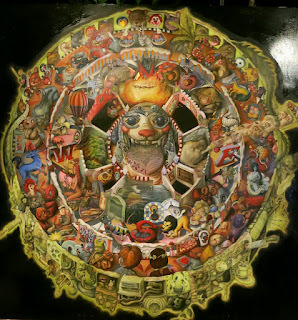 Mad Calendar is complemented by six works (hence The 7 Chronicles of Madness), three oil-on-paper paintings, also circular in composition, from each artist. Completed after the show’s collaborative centerpiece, these smaller, individual works bear witness to how the mimetic process affected both Calayag and Dela Cruz-Gaston. The exhibit opens on June 30, 8pm onwards at Vinyl on Vinyl gallery at The Collective, 7274 Malugay St, Makati. To see the rest of the artworks, click HERE.